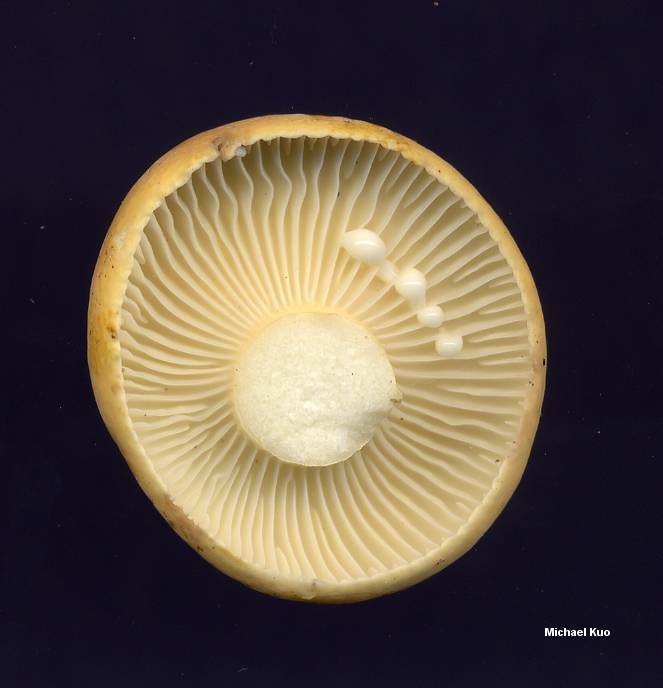 This subtly beautiful Lactarius features a dull orange, finely velvety cap, widely spaced gills, and copious white milk. 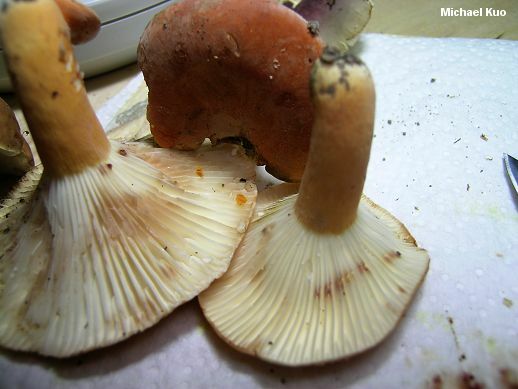 It is similar to Lactarius volemus, but the latter species has close gills and milk that stains everything it touches brown—not to mention a pronounced odor of fish. 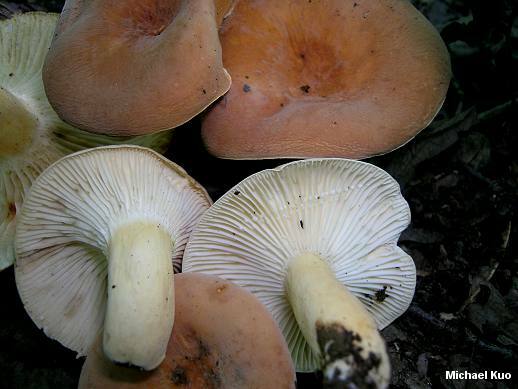 Lactarius hygrophoroides is mycorrhizal with oaks, and appears in summer from the Great Plains to Texas and northeastern North America. 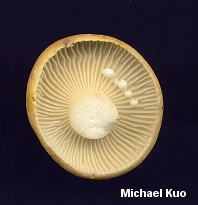 Hesler and Smith (1979) described four varieties, based on odor and on staining of the gills due to the latex. However, Lalli and Pacioni (1992) studied the type collections of all hygrophoroides taxa and found that "they cannot be considered autonomous entities" and that "L. hygrophoroides should be regarded as a single entity, with some variability in smell, latex and context colour-change" (169–170). 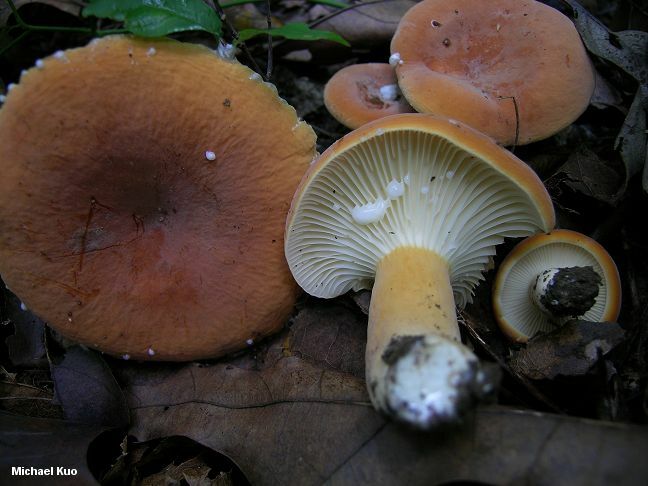 Two species described by Peck, Lactarius distans and Lactarius subvelutinus, are synonyms, according to Lalli and Pacioni (1992). Ecology: Mycorrhizal with oaks and perhaps with other hardwoods; growing scattered or gregariously; summer; widely distributed east of the Rocky Mountains from Texas to Kansas and the northeastern states. Cap: 3–10 cm; at first convex; becoming flat, with a shallow central depression, or vase-shaped; often dusted with a whitish bloom; finely velvety; dry; the margin even, slightly incurved at first; often slightly rugged; evenly colored dull orange to cinnamon orange. 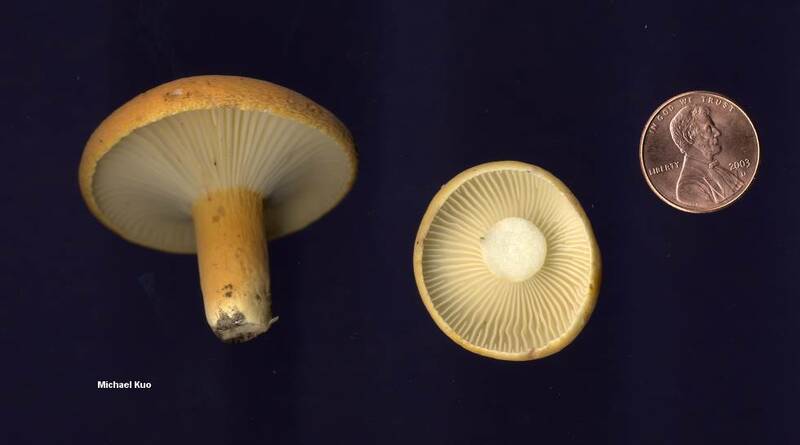 Gills: Attached to the stem or running slightly down it; distant; whitish becoming cream colored or pale yellowish; not staining, or staining brownish where damaged, sometimes with a lavender stage. Stem: 3–5 cm long; 0.5–1.5 cm thick; colored like the cap or paler; more or less equal; bald or very finely velvety like the cap; solid. Milk: Copious; white; unchanging or turning slightly yellowish over time; not staining surfaces, or staining them brownish, sometimes with a lavender stage; staining white paper yellow overnight. 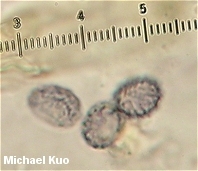 Microscopic Features: Spores 7–9 × 5.5–7 µm; ellipsoid; ornamentation under 0.5 µm high, composed of isolated warts and scattered connectors occasionally forming partial reticula. Macrocystidia absent. 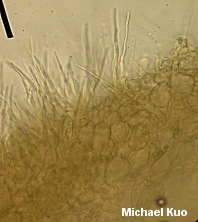 Pileipellis a lamprotrichoderm, featuring a layer of upright pileocystidia, hyaline to ochraceous in KOH, cylindric-aciculate, to about 100 × 4 µm, arising from a cellular layer of subglobose elements up to about 30 µm across. REFERENCES: Berkeley & Curtis, 1859. (Saccardo, 1887; Coker, 1918; Kauffman, 1918; Hesler & Smith, 1979; Weber & Smith, 1985; Phillips, 1991/2005; Lalli & Pacioni, 1992; Lincoff, 1992; Metzler & Metzler, 1992; Horn, Kay & Abel, 1993; Barron, 1999; McNeil, 2006; Miller & Miller, 2006; Binion et al., 2008.) Herb. Kuo 08270215, 07290305, 07210703, 07250802.